In this fast paced and constantly evolving landscape of content management and SEO, microData remains a widely discussed topic. In fact, for your webpage to fully reap the benefits of being search engine optimized (aka search engine friendly), it’s now necessary to include microData markup alongside your content. 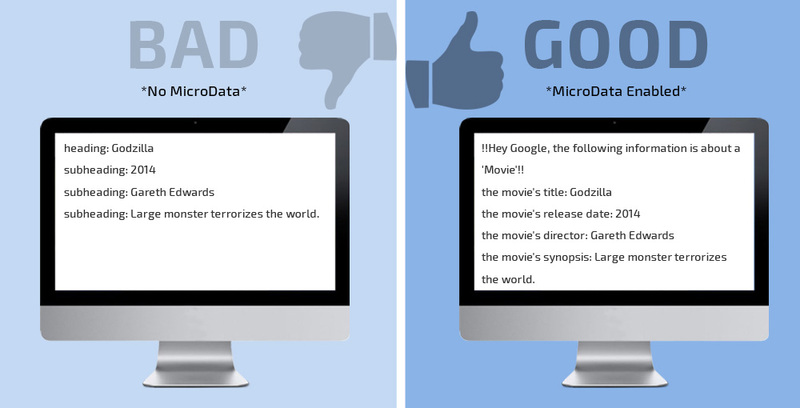 MicroData is code that appends to HTML and is only visible to special search engine robots. Therefore, it has no impact on design or user experience. It’s used to express (to search engines) the type of content and sub-content on webpages. For example, search engines view a website without microData as a virtual hodgepodge of headings, subheadings, and lists. There is no distinction between headings of “this” or “that.” There’s only a single, generic content hierarchy. Alternatively, a website that incorporates microData will automatically inform search engines what type of content is on any given page. Headings and subheadings are tied to specific categories (ex: Movies, Creative Works, Sports) and are easily picked up by Google and other engines. The following is a representation of how a search engine will view a typical webpage vs. one with microData. subheading: Large monster terrorizes the world. The heading and subheading labels are generic and non-descriptive. Humans can tell that we’re talking about a movie, but search engines will have a harder time distinguishing what’s important.
! !Hey Google, the following information is about a ‘Movie’!! the movie’s synopsis: Large monster terrorizes the world. Right away, the search engine knows to expect information about a movie. Each of the movie’s attributes are distinctly labeled and easily crawled. Generic HTML markup (the basic structural foundation of all webpages) isn’t specific enough. HTML can tell a search engine what something is (ex: a header) but it doesn’t explicitly state what that header is describing (ex: this header refers to the title of a movie). MicroData lets search engines know exactly what type of content and sub-content a website provides. In some cases, microData even allows search engines to automatically display a page’s most relevant information directly on a search results page. How Do I Add MicroData to My Website? MicroData is inserted at the HTML level of your website (via code). It can be integrated into popular CMS’ like WordPress and Magento. For more information, I recommend checking out ReadyArtwork’s SEO service page. You can also check out schema.org for more information on microData and a list of officially recognized content types.